Automotive spray gun and the number one factor you must consider when purchasing an Automotive spray paint gun. 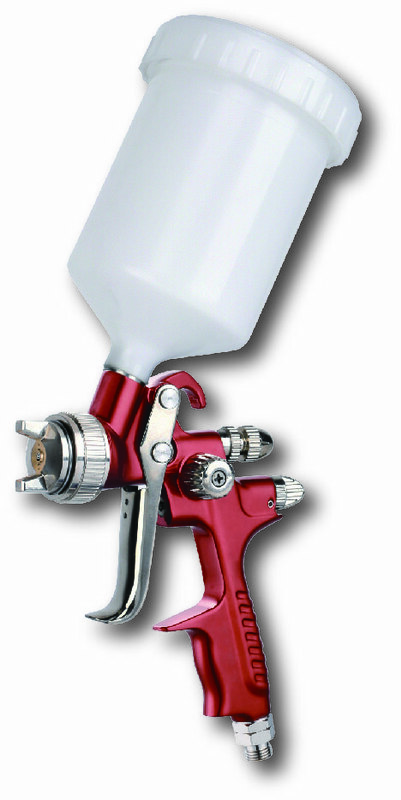 In addition to paint guns, you can purchase air regulator that attach to spray guns in-line with their air supply. The purpose of these air regulator is to help you fine-tune the air pressure at the gun to perfect your paint spray patterns. We’ll talk more about how to perfect your paint spray pattern a little later. So what is the number one factor you must consider when purchasing an automotive spray paint gun? Spray Gun Quality. You see, product literature may suggest a particular setting for inlet air pressure; while Rongpeng air tools can assure you that the operations and aftersales and so on. If you do not have access to this firsthand knowledge, your brand-new spray gun may NEVER operate as well as intended. Inlet air pressure settings are CRITICAL with HVLP spray guns, so it will be worthwhile to ask rongpeng air tools who knows for their recommendations, rather than relying solely on product literature. Let’s beginning to talk about the Rongpeng air tools produce automotive spray gun! As we know with conventional spray guns a typical air pressure of 60 psi or more is required. This quite high pressure blasts paint onto the surface with such force that over 65% of the material is lost due to overspray. Additionally, the high air pressure is more likely to disturb existing dirt and debris and allow it to fall onto fresh paint causing a less than perfect finish. When HVLP spray paint systems were first introduced, they were composed of a spray paint gun and a turbine system that replaced the conventional air compressor. Although HVLP in theory made sense and was accepted as a working concept, the equipment was less than widely approved. The new turbine system caused the air blasting the paint onto the vehicle to get too hot, causing the paint to dry too soon, sometimes even before it had landed on the vehicle. Turbine systems have since been redesigned so that they do not get as hot. A more practical solution was the development of HVLP spray guns that can be used with conventional air compressors. This allows experienced painters to use a system that is more familiar to them and also makes the purchase of an air compressor easier to justify for the novice painter. In addition, the conventional air compressor is far more versatile than a HVLP turbine paint system. How HVLP works is by increasing the volume of paint that can uniformly pass through the spray gun’s ports and nozzle, so that a relatively low pressure is all that is needed to propel the paint material out. The end result is that more paint adheres to auto surfaces and much less is wasted through overspray via paint particles bouncing off surfaces at high pressure. And the benefits of this? Well, with the price of paint material alone being at what it is, the purchase of a HVLP spray gun will certainly pay for itself in a couple of repaint jobs, if not the first one. Not only will you save paint material with a HVLP spray gun, you will see a great reduction in the amount of overspray, which should be of major importance to any part-time auto painter who is working in his/her residential garage or workshop. It has been recommended for HVLP spray guns to use an air pressure of 10 psi at the tip of the spray gun. This is not to be confused with the air pressure at the inlet of the spray gun where the hose connects. It depends on the design of the spray gun but the inlet pressure may sometimes be near 60 psi to obtain the suggested tip pressure. SUCTION FEED /SIPHON FEED – A siphon feed gun’s paint cup is mounted below the air nozzle. This design requires more air pressure to siphon the paint material up and out of the cup. With a non-HVLP siphon feed spray gun, approximately 75% of the paint material ends up as overspray. 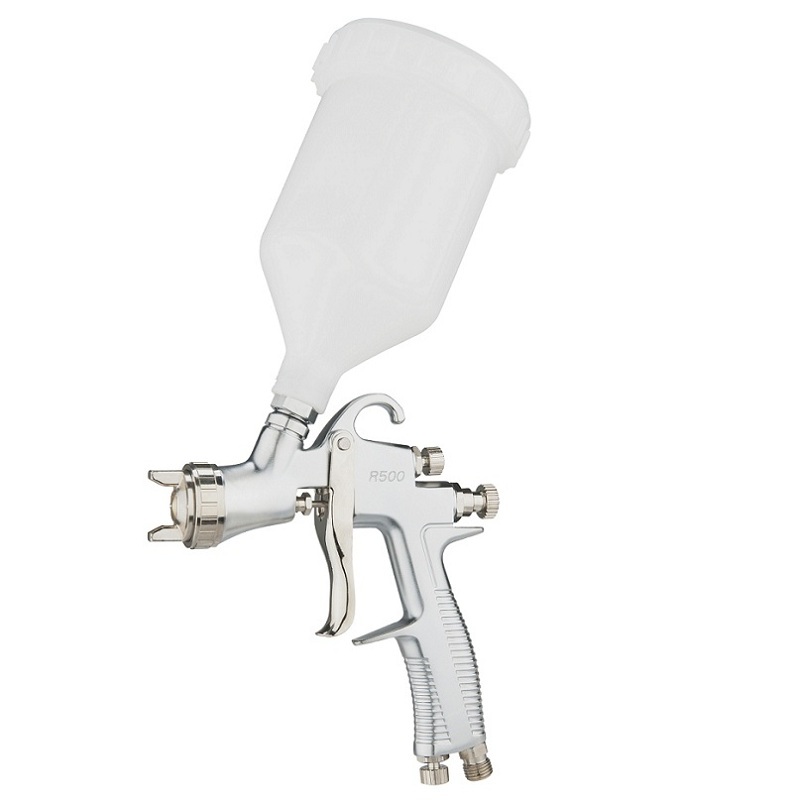 GRAVITY FEED – A gravity feed spray gun has the paint cup mounted above the air nozzle. This allows gravity to do the work for some of the air pressure, allowing for the use of a lower inlet air pressure. However, on a non-HVLP spray gun, this will result in approximately 65% of the paint material ending up as overspray. PRODUCTION GUN – If your painting is going to be limited to large body panels, such as doors, fenders and hoods, a full-size production gun will suit your needs. Commonly having a one-quart paint cup, this gun can spray a fair amount of material before you need to refill. @If the paint is middle-high viscosity,please consider about 2.0mm nozzle for base coat. @If the paint is varnish, please consider about 1.7mm nozzle for base coat. @Usually the gun with 1.5mm for finish coat. @And 1.3mm for top grade paint for finish coat. Please choose the right one which you needed. Hope you would satisfy with it.